Leaders of the New Jersey Education Association often profess disdain for public charter schools. But how far will they go to stop expansion of a popular school that, in response to parent demand, seeks to double its enrollment? For illumination, look no further than the public school wars in Red Bank, a small town by the Navesink River in Monmouth County. This is the home of Red Bank Charter School, founded in 1997, just two years after N.J. passed its first charter school law. Last year the school proposed to expand capacity from 200 to 400 students. That proposal kindled the full fury of NJEA union representatives who made it their job to foment community dissent through a campaign that charged the tiny charter with deliberately increasing school segregation. NJEA won. The Christie Administration rejected the expansion proposal. Now NJEA is gloating about its role in the theatrics. And the celebration hardly ends there: two groups, one called “Fair Schools Red Bank” and the other called “Latino Coalition” have filed a civil rights complaint with the U.S. Department of Justice requesting forced closure of Red Bank Charter School (RBCS) on the grounds that its presence is producing segregated schools. 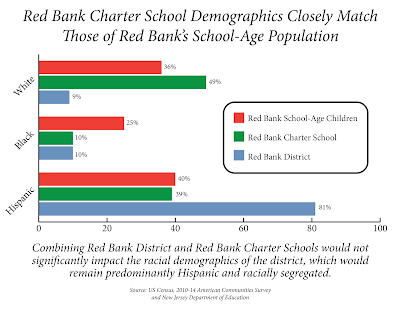 Red Bank is a relatively diverse town (according to the 2010 census, 63% of residents are white and 35% are Latino) but the K-8 school district is mostly Latino and low-income. In fact, only 9.3% of Red Bank Middle School students are white. The rest go to Rumson Country Day School, where Democratic gubernatorial candidate Phil Murphy sends his kids, Ranney School (tuition at both is about $30K per year) or parochial school. 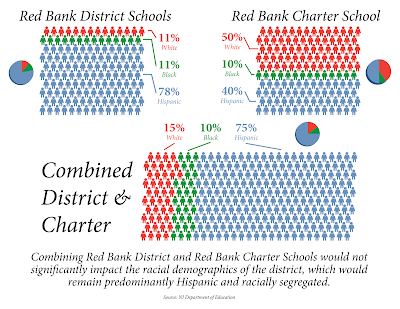 In fact, twenty years ago when RBCS first applied to the State for a charter, one premise was to reduce“white flight." Currently 11% of traditional district students are white and 50% of RBCS students are white; Black student distribution is even (between 10% and 11% at both) and Latino students comprise 78% of district students and 40% of RBCS. Many more students in the two district schools qualify for free and reduced lunch than in the charter. 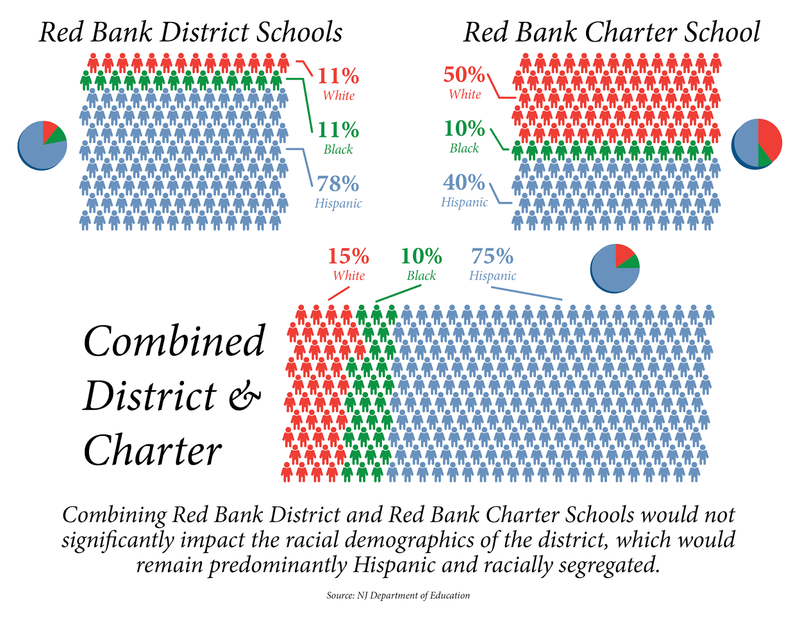 To address this economic disparity, the charter expansion application proposed a weighted lottery that would increase the number of economically-disadvantaged students so that charter demographics would eventually mirror Red Bank's school-age population. In spite of this remedy proposed by RBCS -- which has already been implemented even though the expansion was rejected -- NJEA leaders went full bore, lobbying legislators, organizing opposition, and spending member dues money. .Here are a few quotes from an NJEA article boasting about the union triumph. "NJEA UniServ Field Representative Lorraine Tesauro supported RBBEA [Red Bank Borough Education Association] involvement, bringing NJEA resources to bolster the local association’s needs." Members of RBBEA attended events in force and provided support to parent groups as well as creating and implementing association-led actions. But of course this is all about union leaders looking out for jobs, or at least union leaders looking out for stable dues revenue. Why else fight against an alternative public school that is committed to repairing student demographic disparities? Why else fight against choices for the many families who sit on RBCS’s waiting list? Now that expansion prospects are quashed, the endgame appears to be to shutter the school in order to achieve integration. But this premise is flawed when one considers the actual demographics of Red Bank Borough and Red Bank Charter School. In other words, shutting down RBCS wouldn't change district demographics. RBCS Principal Meredith Pennotti invited the Latino Coalition Director Frank Argote-Freyre to visit and talk directly to Latino parents but he never responded. NJEA hasn't formally weighed in on the civil rights complaint yet, those who worked closely with the NJEA to kill the charter expansion are also leading the fight to close the charter school. Perhaps a better use of their time would be to listen to the parents they pretend to represent.